Recently we told you about the plight of the Swedish filmmakers who created Bananas! *, a powerful documentary which chronicles a courageous fight against the Dole Fruit Company by 12 Nicaraguan plantation workers who had been poisoned and made sterile by the corporation’s toxic chemicals. It is a classic David beats Goliath tale. On the eve of the movie’s Los Angeles Film Festival premiere in 2009, Dole freaked out, and tried desperately to stop the documentary from ever being seen. The huge corporation attempted to sue the independent filmmakers, but eventually were forced to drop the fatuous lawsuit. Now three years later WG Film, Fredrik Gertten and Margarete Jangård, the creators of Bananas! *, have made a new movie: Big Boys Gone Bananas! *, which recounts their victorious struggle against the giant fruit company. This important movie is about billionaire corporations attempting to suppress free speech, something that seems to be happening increasingly often. Big Boys Gone Bananas! * will premiere at the Sundance Film Festival later this month, but this compelling documentary may not ever be allowed distribution in the United States. Ironically, in order to screen the movie in this country, the filmmakers must pay many thousands of dollars for insurance, in case they might be sued. “With the Sundance Film Festival, we’re lucky enough to have the greatest possible launch platform for BIG BOYS GONE BANANAS!*. What we don’t have is the money to pay for the initial costs of such a launch. We’re still suffering from the loss of all the time and money that went into the fight Dole had brought upon us. Against all odds, we did succeed in making my previous film available to people around the world. But this came at a huge price. You can view the trailer for their new film here. 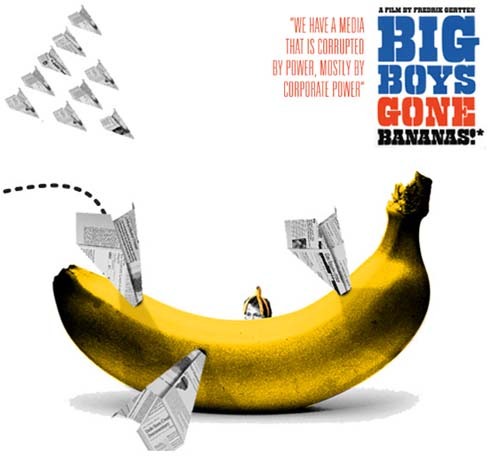 For more information about Big Boys Gone Bananas! *, as well as how you can get involved to help protect free speech, please visit their Kickstarter page or the documentary’s website.